Feynman. Salam. Weinberg. For the past 50 years, the International Conference on High­-Energy Physics (ICHEP) has been the meeting place of giants in the field. Now, a new type of giant dominates: the thousands­-strong collaborations of Large Hadron Collider (LHC) physicists. This year, experimental and theoretical physicists converged on Seoul, South Korea, to share their very latest results. The ATLAS collaboration unveiled a wide range of new results, including major developments in the measurement of Higgs boson properties, observations of key electroweak production processes and new high­-precision tests of the Standard Model. Before last week, one major production and one main decay mode of the Higgs boson had not been conclusively observed by an LHC experiment: its decay to a pair of b quarks (bb) and its associated production with a W or Z boson (VH). On Monday 9 July 2018, during the first plenary session of the conference, ATLAS reported the observation of both of these “missing modes”. In a preliminary result using 2015­-2017 data, ATLAS reported the observation of the Higgs →­ bb decay. Despite being the dominant decay mode of the Higgs boson, accounting for nearly 60% of Higgs decays and thus main responsible for the Higgs natural width, this was the first time its observation could be achieved. This is due to the overwhelming number of b quarks generated in LHC proton­-proton collisions – most of which originate from different processes, not of interest in this search. But what if we could use characteristics of the Higgs’ production to extract the signal from the background? That’s were the second “missing mode” comes in. ATLAS physicists were able to narrow the search by only looking for b­-quark pairs created in association with a W or Z boson (VH). This technique was fantastically successful, reaching a precision of over five standard deviations (or “sigma”) with all channels combined. With the observation of VH production now in hand, ATLAS has observed all four main production modes of the Higgs boson, of which the even rarer ttH production was reported also this year. Through their combination, physicists can gain new insight into the Higgs couplings to other fundamental particles. So far, these have been in excellent agreement with Standard Model predictions over a range covering three orders of magnitude in mass, from the top quark (the heaviest particle in the Standard Model and thus with the strongest interaction with the Higgs boson) to the much lighter muons (for which only an upper limit of the coupling with the Higgs boson has been obtained so far). Despite H →­ bb being the dominant decay mode of the Higgs boson, accounting for nearly 60% of Higgs decays, this was the first time its observation could be achieved. “In good agreement with the Standard Model"
In addition to important Standard Model measurements, ATLAS presented a number of new searches for physics beyond the Standard Model. Of particular note were the combination searches for heavy resonances decaying into bosonic and leptonic final states, and for the pair production of vector-like quarks (VLQ). Both new results significantly extend the single-analysis sensitivity of these searches. Further, to complement and extend the searches for pair production of VLQ, ATLAS also looked for the single production of VLQ using 80 fb-1 of data. No significant deviation from the Standard Model was observed in these searches. The phrase “in good agreement with the Standard Model" was oft repeated at ICHEP, both in and out of sessions. While agreement with the Standard Model may seem anti­climactic, every new result improves our knowledge of the physics at the energy frontier, where nothing could be taken for granted before it was measured by experiments. Bit by bit, physicists are identifying where they should look next and, based on the results so far, it seems new physics might be hiding in unexpected places. There were, however, a few rare instances where the opposite would be heard: "deviations". Key among these was the measurement of top quark spin correlations, found to deviate from the Standard Model by over three sigma. While the cause of this deviation is not yet clear – it may be explained by yet insufficiently accurate modelling – the precision with which ATLAS has achieved this measurement is without doubt impressive. 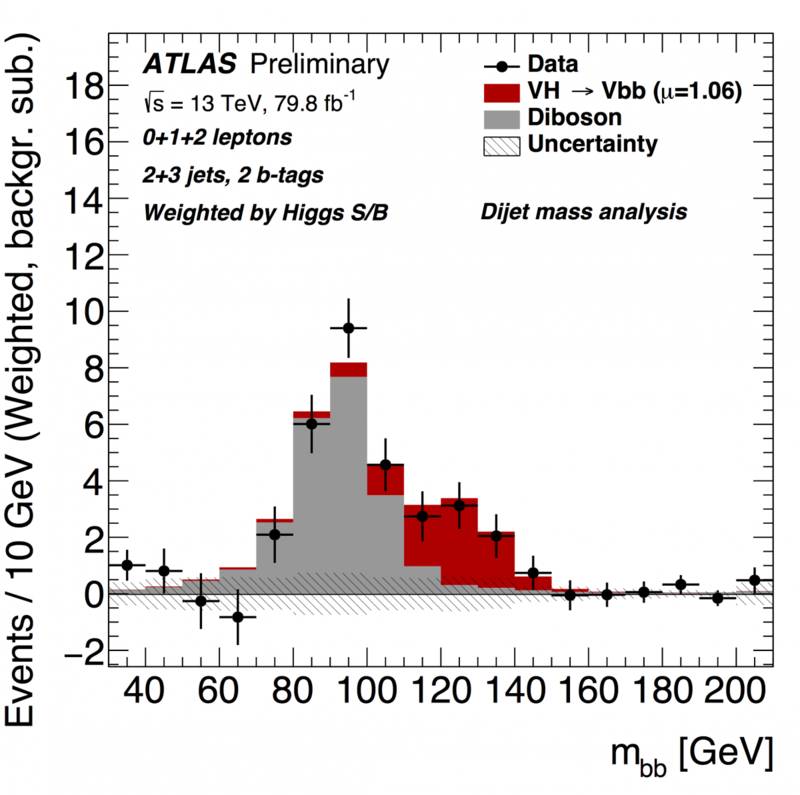 The observation of W and Z boson scattering was another stellar result presented by ATLAS. Likened to the meeting of two "weak lightsabers", it is an important test of the electroweak sector of the Standard Model. The process was observed in both WW and WZ production. The new ATLAS result established the scattering of W±W± → W±W± with a statistical significance of 6.9 sigma, and that of W±Z → W±Z with a statistical significance of 5.6 sigma. The observation of vector boson scattering opens a new chapter of Standard Model tests, allowing ATLAS to scrutinise quartic boson couplings and properties of the Higgs boson. In a new high-precision analysis, ATLAS also probed the electroweak sector with a measurement of the electroweak mixing angle with a precision of 0.15% on sin2θW, which is the most precise LHC result obtained so far and competitive with the most precise single­experiment measurement of this key Standard Model parameter. It may help solve a longstanding conflict between legacy measurements from the LEP/SLD era in the 1990s. In addition to presenting a wealth of new physics results, ICHEP was also an opportunity for the community to raise important issues and ask the hard-hitting questions about the future of the field. Many of these were addressed on Tuesday during a panel discussion of directors of the world’s high-energy physics laboratories. Among them: Fabiola Gianotti (CERN), Masanori Yamauchi (KEK), Yifang Wang (IHEP), Jonathan Bagger (TRIUMF), and Joel Butler (on behalf of Fermilab). Furthermore, with the LHC continuing to deliver extraordinary precision results, and the future HL­LHC upgrade still on the horizon: the possibilities are wide open.